My memories of the house on Lipply Road are filtered- all of them- through the veils of other persons’ presence in the house, and of childhood. Even on my last visit to the house earlier this month, I stepped lightly, as a trespasser, as a child doing something I shouldn’t be doing. It was a house now, no longer our home. It was vaguely home-shaped, to be sure, but for now, for me what was, was no more. I walked through the kitchen that was, up the stairs that were, but they were not our kitchen, nor our stairs any longer. They belonged to someone else and my great hope as I furtively moved from room to room was that someone soon would begin another fifty year journey of home in love, in life with this house. I can only assume, because I must, that this was a visit where I was saying “goodbye” without consciously knowing that I was saying that word. The house was empty now of all which and whom I had loved there. Even without knowing the terrible news which would come in a few weeks, I knew this was an ending of something, something still inexpressible. When I pulled the door shut behind me this time, I didn’t linger. There were the four of us, of course: Dad, Mom, Denny, and myself. 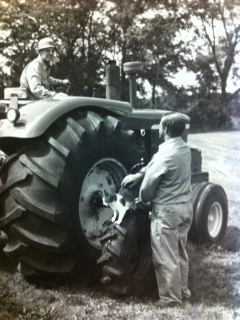 Since Dad’s work was on the other side of the driveway, our home extended right into the barn, into the plowed fields, everywhere in the woods, and all around the south shores of Pine lake. The tire-testing circles were our bike-riding tracks, the old horse race track in the woods was our and the neighbors’ perfect and safe place for beginner’s driving lessons. The men who worked at the test Center were our friends. 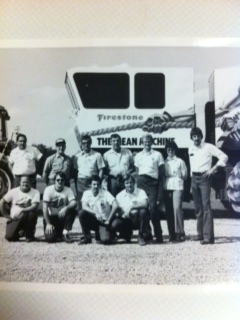 The earliest ones- Mac, Mr. Raines, Mr. Wise, Arthur, and Leonard- were our mom’s and dad’s cooperative volunteer childcare workers as Denny and I, even as small children, made the whole 90 acres our playground. How many football and baseball games in front of the barn with the baby-boomed abundance of neighbor kids our same age? How many bicycle tires fixed, patched and pumped by Mac, the shop manager, who would stop welding some Firestone-sanctioned job to help us? 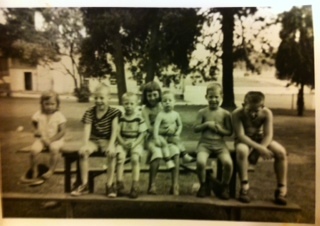 Most of Dad’s many brothers and sisters lived within a few miles of Columbiana. Mom’s brother and several sisters lived in the Akron area, too. Those aunts and uncles (33 total!) had a lot of children, and their children did, too. 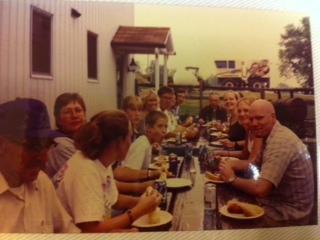 So there was an abundance of aunts, uncles, cousins and second-cousins who would frequently be visiting. I have specific memories of every one of our 45 first cousins being in the house, many frequently and continuing even through the time Mom was there by herself. Because the house was big, it was often the place for the Weber’s annual Fourth of July picnic and Christmas night get-togethers. I know I am only one of many cousins who still feel that “pull” on the Fourth or at Christmas. 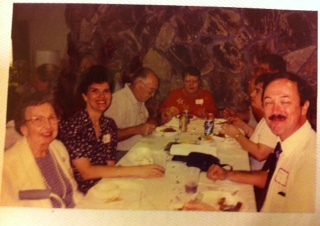 These were reunions which had been happening for decades already and they extended well into the late sixties. Watermelon, homemade ice cream cranked with broken block ice from Corey’s Oil in the summer or Pine Lake ice in the winter, turkey and ham at Christmas, Hamburgs and hotdogs on the Fourth, always Auntie Olive’s so-green pickles, Auntie Alice and Uncle Bill’s kohlrabis, and so much else. At Christmas, Auntie Alice would disappear and a forlorn looking but exciting-for-the kids Swiss Santa would show up to hand out gifts in a dollar-per gift exchange. At Christmas, each Weber woman would bring her “Weber cookies.” These were special and had roots in Switzerland and were made with baker’s ammonia (!) but they signal still for me the Christmas season every bit as powerfully as the singing of “O, Holy Night” by some slightly off-key alto soloist. Denny and I could tell which aunt or cousin had made which cookie by their texture, thickness, and brownness. Virtual Family: Mom and Dad’s Sunday School class at Grace Church. This was the WWII young people’s class, organized in the 1950s. 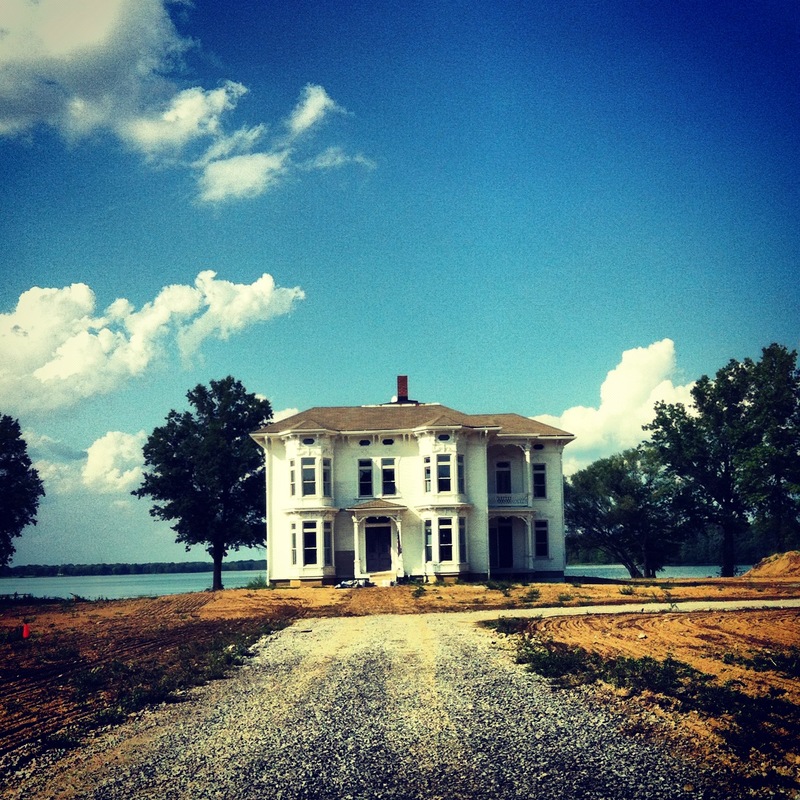 They were all making their own homes, babies, and lives in Columbiana and there were many of them. When I was at Grace Church for their Bicentennial a couple weeks ago, I compared these men and women to another whole set of aunts and uncles and their many children as friends/almost cousins. Most of the adults are gone now, and many of those my age have long ago scattered, but..for awhile..there was a Grace-begotten Camelot. We (the young ones) would sometimes put on shows for our parents using the built-in stage of the sliding doors which enabled the one great room to be divided into a dining room and sitting room. Reash, Candel, and Weber kids used those doors in ways they were never intended to be used, but boy were they fun (and how easily I can hear and feel those doors, right now). The ancient downstairs “second” kitchen (with a hand pump in the sink) became a playroom for little kids and then a family TV room as little kids grew up. It’s where cousins Kenny and Gail Miller, and our moms and dads watched the Beatles debut on Ed Sullivan, yeah yeah yeah, just several months after I had sat in that same room watching the weekend of November 22 to 25 with the rest of America. For years before Denny and I left home and for many years after, Mom made about a million cookies, ten thousand cakes, and twenty thousand pies for customers who kept coming back and as donations or gifts to whoever had caught her eye and heart that week. (I exaggerate the numbers, but not by much!) For every Street Fair she would make 30+ pies to be sold at Grace Church’s food area. And she did that for almost forty years. 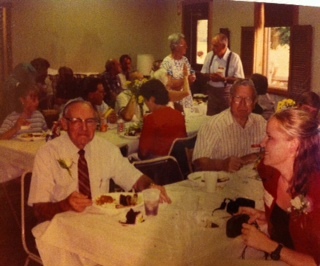 Later, Dad would help her cater meals around town for various groups, and frequently for the men working in the barn, and that’s to say nothing of the food Mom prepared for Grace’s once a month “Come whoever wants to and pay whatever you want” lunches which she “engineered” for years. 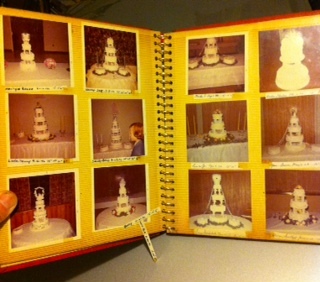 Here’s a picture of one page (of 20 pages) of pictures she took in the 1970s of wedding cakes she made! And ALL of this cooking was done in that single kitchen of the house! All that food is part of the reason the whole town is connected to this house! Just as I tip-toed through the house earlier this month, I tip-toe now a little ways back from immediate rush of memories of the house, the home. Five days before the fire, we had to say goodbye to our Golden Retriever, beloved Salem, who for fifteen years had loved us as we loved him, with a love that is too complicated, too big for words. Sometimes words detract from reality because they must, by their very nature of being “only words” be less than what we are trying to describe through them. But we have to try, and that’s what I’ve been doing, and now I have to be quiet for a bit. At least about these two, the dog and the house, which are no more. Physically, Salem and the house are gone. Emotionally and spiritually, though, they are wildly alive in my heart. I knew that was true of Salem, of course. All who knew him have mourned. 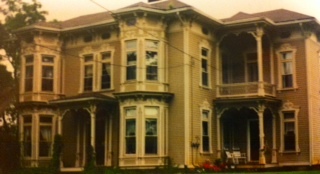 But it has been healing to see and hear of the love expressed for this 134 year house, too, by so very many people. I lived there, it was home, but it was not “mine” any more than Salem was “mine.” The really best things, the true things in life are those that we share outside the boundaries of “ownership.” The best things belong to us all. Our perspectives may differ, the intensity of our feelings may vary. But the best things, the very best things in life are..
“Father of all, we pray to you for all that we love, but see no longer. Grant all of that which is loved, your peace; let light perpetual shine upon all of it; and in your loving wisdom and almighty power work through our memories of that which we loved the good purpose of your perfect will; through Jesus Christ our Lord. . This porch was one where a young tired-looking blond woman came one cold Saturday afternoon in about 1960 and asked for a drink of water. My mom told her to come in and sit down and I drifted into another room because the woman did sit down and began crying and I remember nothing else about that incident except that mom seemed to know what to do. This porch was the one from where Robbie and I entered the house carrying Joshua, three months old, at Christmas in 1974 and it was this porch where Robbie and I and Joshua, Darcy, and Sarah stood and sang “Jingle Bells” to announce our late night arrival for Christmas in 1981. This porch was the one where Denny and I sat with cousins in November 1999, remembering when we had all years earlier played ‘Hide and Seek’ and ‘Cops and Robbers’ upstairs while our parents visited downstairs. It was the day of Dad’s funeral. 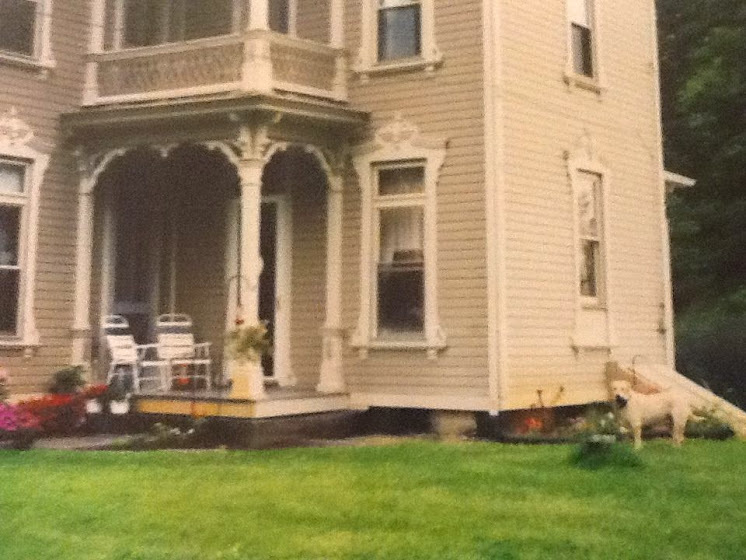 And..this porch was the one where, while I was on a visit home in the Spring of 2004, I knew for certain what I didn’t want to know for certain when Mom went outside to look for Dad to call to supper. Later that Spring was when Denny and I buried our mementoes when saying goodbye to the house. We buried them in a now-forgotten distance south then east, from this porch. I keep thinking, imagining places in the house I would like to run my hands over one last time. It has become an almost obsessive thought. One would be the stairway bannister (18 steps up, hover over the heat register at the top, continue). Another would be the window in the bay by the bed where I slept. It opened to the east and looked out over the green then golden then bare then green again gingko (second largest gingko in Ohio!). And the top of the fireplace in the dining room- the fireplace in which thousands of hot dogs were roasted, hundreds of marshmallows were burned to a crisp, and where innumerable pennies were thrown into the hot coals to turn fiery red. And the porch, that porch. Just one more time. Black Walnut stands were still plentiful, thick and tall in the still-to-be-cleared forests of 19th Century eastern Ohio. As farms were established and as the country settled into a time of renewed movement westward, the Walnut trees were felled, milled, and shaped into the realized dreams of those seeking place, community, and permanence. The Walnut planks- deep chocolate brown become golden- were wrapped around the interior junctures of ceilings and walls, walls and floors. Grooved and rounded, the crafted wood became the frames of windows and doorways. Lathed, they became the bannisters and rails of stairways. Steps, cupboards, thresholds: all were the finishing grammar, the Walnut-brown punctuation of a well-built, well-founded, well-appointed home. 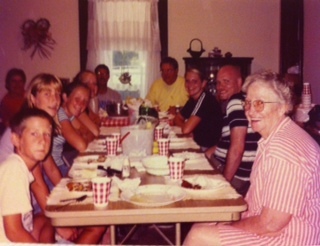 When our family arrived in the Lower/Firestone home, it had been five years empty. Seventy-three years from its being cut and carpentered from the surrounding woods, the grand old house had been abandoned by the elders for the convenience of living in town on Elm Street, and by the young for the seeking of fortune in California. Filled with the ephemera and left-behind effects of a once-vibrant, socially active and commercially successful family, and in preparation for our family’s moving in, piles of papers were boxed and discarded, the house was mopped and dusted, the walls were painted (sky blue downstairs, yellow kitchen, beige upstairs), five of the six fireplaces were closed off, and the hulking half century-old coal furnace was cleaned. 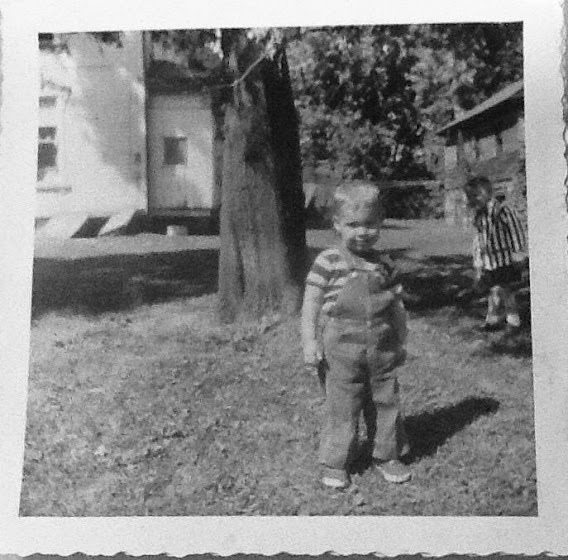 The night we moved into the house, in the fall of ’53, I wore red socks to bed. The room was very big- the ceilings were high, there were a lot of windows, so much dark wood, a fireplace on the other side of the room, and I was on the second floor. And there were sounds. Later, I would come to know the wall-creaking and roof-scampering sounds as the friendly noises of an old friend. But on that first night they were the stuff of a child’s terror, and I opened my mouth and cried out for..Mommy, Mommy! I remember that first night; I was four. I would remember much much else in this place in the ensuing fifty years. The house is always a character, a participant in those memories. The house became a standard established in childhood by which I’ve measured every place I’ve lived since then, and there have been many places, and perhaps that is why. I left that home in 1971 but visited often, with one, two, then three kids. 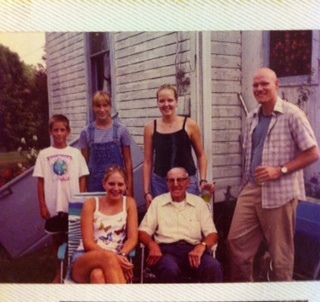 And then, in 1999, Dad was gone. We packed up and moved Mom out in 2004. The next day, the home we had there was a home no more. Denny and I buried mementos of ourselves and of Mom and Dad in the front yard the night before we closed and locked the back door for a final time. It was for both of us an act not of worship, but of inexpressible thanksgiving. Which may, as I think about it now, be the substance of worship. The mementoes are still there, buried deeply in a metal Chock-Full-of-Nuts coffee can which had served for decades as the back porch house key hiding place. They are worthless; they are invaluable. If anyone ever finds them, may they have some inkling how this place was loved. Because of what I do in my profession, I must often lead people into, be with them, and stay with them through times of grieving. What follows is how I am dealing with my own grief over the death of this dear friend. I write about times and memories which transcend specific experiences and which have been (for me) transformative. If people read over my shoulder as I write these things, that’s OK, but it’s not why I write them. I write things like those that follow to stay sane, to keep from being emotionally crushed by my own grief as it has been added to empathetically by the grieving of others.